In Finding where Drive hosting is being used in Sites, we created a couple of sheets by examining the hosted files referenced in a Google Site so that we could sort out the world after Google Hosting goes away. The next step was to identify those files and organize them, as described in Identifying hosted files. If you are happy with its proposals, now we can make a copy of the files that are going to be rehosted to the folder structure produced by the Identifying hosted files. Of course you could do this manually, but automating it avoids mistakes, and more importantly, keeps the work flow going for future stages. You get 1 report, which now includes the new Drive id of each of the copied files. Any required folder structured are created according to the folderPath in the report. It starts with the settings, which have been expanded to now look like this, and we're mainly concerned with the Settings.copy section. This will create a new sheet, so sheetId and sheetCopied say where. clearFolders - if true, this removes all files in each of the hosting folders. This will usually be false, unless you are doing some kind of a clear up. 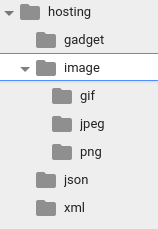 Here's what you get, with a copy of each input file in the re-organized folder structure.